Why would there be a daisy in my toilet? I traveled a fair bit for my job as the Microsoft Pragmatic Evangelist, and I’ve seen a lot of this country, and even the world. Mostly from the inside of hotel and conference rooms, however. Regular readers remember various posts about palatial hotel rooms I’ve been assigned as I was the ‘last one in’ for the night, and / or ‘the first one out’ in the morning. Come to think of it, it’s been a while since I’ve posted these; I’ll start doing that again. Not that I get to use the rooms; it’s kind of cool just to see how the other 3/4 lives. 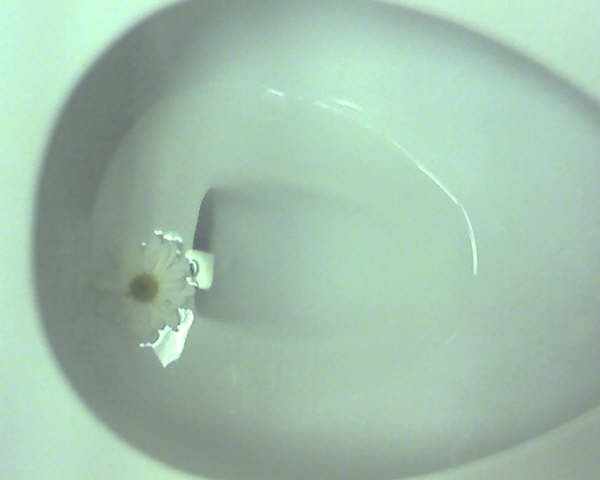 One of the oddest things I’ve seen lately (especially being that we’re well out of Spring and starting to look Fall in the eye) was this: a daisy in my toilet. For fun, let me paraphrase Samuel L. Jackson: "I am sick of these #*! daisies in my #*! toilet".